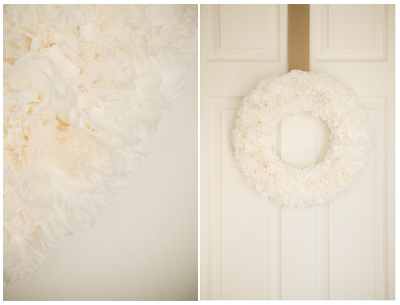 i absolutely love how this wreath turned out, who knew cupcake cups and coffee filters could be so pretty. it looks rather like carnations don't you think? Sarah! It's awesome. So you. Give us some DIY tips -- I would love to try this. Looks awesome, bravo! great job! it is beautiful. Wow, very creative! Love it! i want to know how you did that!! so cute! this is beautiful! is there a how-to out there somewhere? i'm going to blog about this and give a link to your blog! soo neat. I posted this on my blog and gave you credit! Lovely! I would love to know how you made this beautiful wreath! I want to make one of my own :). I guess I'll just have to wing it and hope for the best. welcome to my blog. i blog because people asked if i did, and i didn't, but now i do. i love the little things in life that make me happy, and thought i'd share a few with you.